Cordula Schacht, whose father was Hitler's minister of economics, is representing Joseph Goebbels' estate in the case against Random House Germany and its imprint Sidler over the biography written by professor of modern German history at Royal Holloway, University of London, Peter Longerich. Longerich used the diaries for his ‘Goebbels’ biography published in Germany in 2010. The same extracts from the diaries are now expected to appear in the English edition, which Penguin Random House UK and its imprint, The Bodley Head, is set to publish in early May. Random House had initially agreed to pay 1 percent of the net retail price to Goebbels' estate, but later retracted. Lawyer for Random House Germany, Rainer Dresen, told the Guardian that the dispute is not about the money but about morals. “We are convinced that no money should go to a war criminal,” he stated. According to Dresden, others did pay for the use of Goebbels’ diaries, written between 1924-1945, in the past. “We're the first publishing house who avoided that – and have been sued,” he added. Mr Dresen said he was taken aback when Schacht first contacted the publisher demanding money. 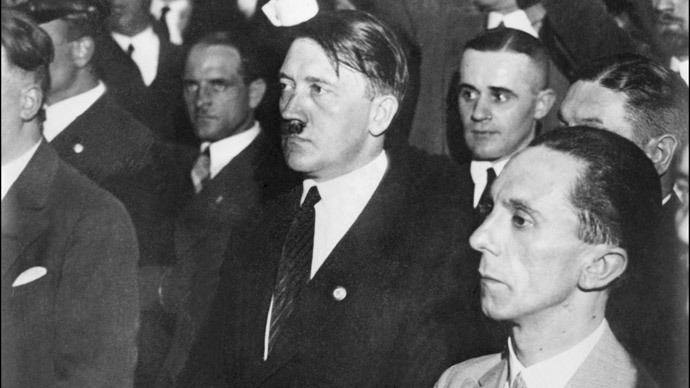 “I did not want to believe that anyone can claim royalties for Goebbels’ words,” he said. Dresen suggested to Schacht, who owns the rights to Goebbels' diaries, that royalties be paid if she agreed to donate them to a Holocaust charity, but she reportedly rejected the idea insisting that the money must go to Goebbels’ family. “In this case, we are dealing with the daughter of a cabinet colleague of Mr Goebbels. This is an absolutely unacceptable situation. It’s a question not only of morality, but of professionalism for a historian,” he told the paper. Random House has questioned the copyright ownership of the Goebbels' diaries, which were to be published posthumously by Hitler's publisher. There's no publisher’s contract available to prove the intention, however. Dresen claims that the Bavarian government should own the copyright. The Nazi propaganda minister poisoned his six children before he and his wife committed suicide in Hitler's bunker in 1945. His diaries remain in copyright until the end of 2015, with copies in public libraries.